When Michael Riley is left to care for his baby nephew Scott his life is about to change on every front. His sister and her husband designated him in their will as Scott's guardian, and shortly after that a tragic accident takes both parents, leaving Michael to raise the baby, but is is not all so simple. Scott's grandfather on his fathers side is a traditional Southern Senator, and is outraged at the prospect of Michael, a young gay advertising executive raising his grandson, and so proceeds to challenge the will through the courts.The story begins, third person narrative, shortly before the tragic accident, and follows Michael's initial refusal, and then determined at all costs efforts, to take on Scott. To help raise Scott he takes on Gray, a gay young French Canadian vegetarian hippie and part time Montessori teacher as a 'governess'. We follow them through the ups and downs of the court case. Scott takes over the account in Book II. Scott takes us through is life with Michael and Gray, his schooling and on into young adulthood, and describes the effects of Michael's progress from the initial struggles to growing financial success and becoming famous and very rich. Book III, is a short conclusion in Michael's voice.This promised to be a fascinating story, but I was disappointed mainly because the humour got in the way. It is undoubtedly a very funny book, witty at times but often the humour degenerates into pure slapstick. There is no doubt the author can create some extremely funny scenes, and if that is what you want from this you won't be disappointed, but I felt that a lot of the potential here was lost for the sake of a laugh. Some of the characters are more caricatures; Michael comes across as excitable, eccentric and overly prone to histrionics, Gray as a excessively motherly to both Michael and Scott, and most of the other characters are extreme in one way or another. One of two incidences of the humour some might find to be in bad taste, and some scenarios are included purely for comic effect having little to do with the story at hand.So for me this book did not really deliver, it had its moments, but it did not come anywhere near to touching on the real life of a young gay man raising a child from babyhood. All the possible intricacies, subtleties, problems or tender moments where regrettably thrown out in favour of farcical humour or acerbic wit. Great start but lacked a lot as you read through the end. Kind of predictable but not terrible. Maybe one of the worst books I've ever read... and that's saying something. There are two distinct stories represented in "Say Uncle," neither having any real connection to each other, except that the characters are the same. The first half of the book is about a gay man who suddenly finds himself guardian of his baby nephew when his sister and her husband are killed in a car crash. A custody battle ensues with the paternal grandfather. The second half deals with the now grown nephew and his love affair with a southern belle and dealing with her ultra-rich, Texas mogul of a father. So, in reality this was two novellas smashed together.But this is hardly the worst thing about this book.The characters were rather two-dimensional. The uncle is your typical aging Queen, his partner is only a shadow of a figure popping in every so often to add a snarky quip to the dialogue. The nephew is a blank slate. Just a kid, no real personality of his own, nothing outstanding about him. And all the other characters were about as predictable is you can get. No nuance at all.At the basic level, the plot is intriguing. Well, the first plot, not the second. But a gay uncle fighting for his custody rights for his nephew? That makes for good drama. Too bad that Eric Shaw Quinn stumbled over well-worn and outright ridiculous tropes to give the story flavor. And what's worse, he didn't even close out the first plot line to any satisfaction. He simply found a way to brush it off and pretend it didn't matter. Is "Say Uncle" the worst book I've ever read? Well, no, because I have read both "Twilight" and "The Art of the Deal," both which could burn in hell for eternity for all I care. But I do feel I wasted an afternoon with this doorstop. My advice to anyone who is considering this for the summer reader... perhaps stick to the instruction manual that came with your Ikea furniture. It has a better plot. Eric Shaw Quinn wrote a marvelous novel named Say Uncle, it was about character named Michael Reily whom was different from everybody else. He was normal guy who lived an everyday normal life: going to parties, drinking, having an office job. However, Michael was not very much liked by society as a whole because he was homophobic and this novel based on the time back when being homosexual was not accepted as much. What I like the most is how Mr. Quinn goes through this novel and not once does Michael ever flaunted that he was homosexual nor did he have a significant other. No, he was judged because of his feminine characteristics that he portrayed throughout the novel, for instance how he dressed and how he through these huge extravagant parties. Nobody made it a big deal that he was gay until after a tragedy that resulted in him having custody of his baby nephew and society as a whole believed he was not a “perfect” parent suited for this child all because he was “different.” It is just something we humans do to everybody even now, we judge a book by its cover or make stereotypes out of one another instead of supporting each other. I added this to my 'gave-up-on' shelf. Wanted to give it a go because the guy is good friends with Chris Rice and I love most of Chris's work, however, this book was just terrible. I haven't put down a book in a long time, but this one I just couldn't get into. Characters were annoying and underdeveloped. Kind of messy. 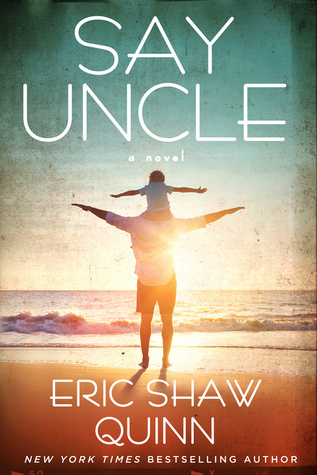 Nearly 20 years later, Eric Shaw Quinn's funny and often poignant look at a single gay man's struggle to gain custody of and raise his nephew is still as fresh and relevant as today's headlines. The book takes place in a a conservative Southern town over a period of time seemingly the 70s, 80s, and 90s, and in a political environment where a gay man adopting is still controversial, and gay marriage isn't even yet on the plate. What I like best about it is it's verisimilitude... the book immediately immerses the reader in a time and a place not so far in the past when the prejudice against homosexuality was so great that the only way its gay protagonist is able to achieve respectability is to live as a veritable monk or sexual neuter. We are not so far removed from this view in modern society, and the book very naturally takes the reader back to that place.This book is parenting and sacrifice, and the society's callous behavior towards those deemed as different or "other," specifically, in this case, Michael because he is gay, but it doesn't take a lot of reading between the lines to pick up the tone of indictment of the practice of demonizing and dehumanizing of those who are unlike ourselves. Michael is a very human character. Without ever losing its sense of humor, the book lets us feel Michael's pain and loneliness, and the lengths to which he is willing to go in order to have a family. Because he is so human, when he is treated unfairly, it resonates with the reader. We care about what happens to him.The book was a pleasure to read, with it's light touch on heavy issues. I had a little bit of trouble with a switch in character point of view (from uncle to nephew) that occurs in the middle of the book, but other than that I found the book's pacing very successful.My overall impression is that this is historically important work that creates a very good window into the period of time in which it was written. I seriously love this book. I had to put this book on my list because it is the first book that Eric wrote, and I think that everyone should read it. Plus I wrote all that stuff about Star..so it is only fair that I add this book too. This is the touching story of a gay man who is the guardian of his sister's child following the death of her and her husband. Written at a time when there was a lot of controversy surrounding gay parenting. This story shows how one man deals with society and his role as a caretaker to raise this child. I want to reread it again now. I read this book when I was in high school. Well actually I got half way through it and didn't finish it. I was sorry to have not finished it. I looked in every book story I could think of and went to libary trying to find it. I eventuly found it on line. I got the book finished it and loved it. I wish that Quinn would come out with another novel because I really enjoyed his writing. It's was different than anything I've read but it told a great story and I will reread it. LOVE this book. the characters are amazing. the dialogue is great. the storyline is fantastic. the ending is simply perfect. highly recommend this. <3 Michael <3 Scott. i was hooked from the first page and couldn't put it down. I read this book many years ago when it was first published in paperback. Today for some unknown reason it popped into my head as a book that I would love to read again so I am going to try get a copy for my kindle. Fabulous read. I enjoyed the non-conformist nature of the lives in this book. Good characters, good story. Most people have comfort food. I have comfort media. Movies, music, books that I turn to when the world overwhelms. This is definitely on my list of comfort reads. Amazing book. A joy to read. Pure entertainment.